Very few people establish New Year’s Resolutions that they actually stick to, which is a shame. Though year-long goals can be intimidating and hard to hang on to through life’s twists and turns, there are still simple things one can do to significantly increase one’s chances of actually following through on one’s objectives, be they big or small. Many people make the mistake of establishing goals they don’t actually care about. I might hear, for example, that it is a good idea to “be healthy”, and so when people ask me what I will be striving for in 2013, I may just say “Oh, I want to live a healthier life”, but unless health is a particularly urgent concern in my life or a subject about which I am particularly passionate, I will not have the motivation I need to keep going when achieving this goal becomes even slightly inconvenient. It is far better to establish goals that revolve around your passions, obsessions, and urgent desires. Things that will pull you through a long night or a hard day and almost always overcome that small “I can do this later” voice that so commonly drags goals into an untimely grave. Another problem with a goal like “be healthy” is that it is too vague to really be achievable. How do I know when I have become healthy? What is “healthy”, anyway? Goals that we can actually follow through on are discrete and attainable (though it is fine for them to be a challenge as well). The achievable version of a goal to get “healthy” might be “complete a marathon this year” or “lower my blood pressure to X amount” or “be able to jog for 90 minutes without stopping for rest”. Studies have found that breaking goals down into VERY SMALL pieces and turning them into habits can make them more attainable. Should you make a goal of writing eight Hubs every month, you might craft a regular Hubbing habit by starting with small goals and moving up. After returning home from work, sit in front of your computer, open HubPages, and log into your account. The year is almost up- are you ready to embark on your goal-seeking quest? Before you begin, let us address one final thing: setbacks. I bet you have some awesome objectives, and want to be sure that unexpected twists or a lack of inertia stop you from achieving them. After all, people would not achieve amazing feats, such as making it to the peak of high mountains and winning major wars, if they turned back at the first sign of trouble. Setbacks are inevitable. By expecting and planning for them, we can keep unexpected hardship from derailing us entirely. While it is impossible to know exactly what setbacks you will encounter, it is easy enough to build leeway and protection into your goals. Even if you cannot completely plan for a setback, simply expecting complications will make it easy to bounce back when they come. Anyone can bounce back from a shattered goal-achievement process so long as one wasn’t depending on a finished piece that didn’t have a bit of glue holding it together. Some goals are not derailed by setbacks, but rather inertia. Either one does not see as much immediate positive feedback as one expects, or one simply loses focus. One thing you can do to avoid this folly is to schedule regular goal checkups. Have a friend check in with you, or schedule times to evaluate yourself, as the days, weeks, and months of your goal achievement process progress. In the past, I have written letters to myself in the future to be opened at specific dates. When I receive those letters (full of hope from my past self about achieving some sort of goal) I feel all the more compelled to continue my work and not let her down. After all, we all secretly hope that our past selves would be proud of our present selves, right? The only thing you should not change is your persistence and optimism! With a hearty dose of those, you can most certainly win! Deciding on what to cover each month of an editorial calendar, or choosing small achievements that can help you move toward a very big goal, can be tough. For some ideas on how to begin breaking things down, check out the hypothetical monthly themes associated with the five fun goals we outlined earlier this month. Because becoming an active netizen is a somewhat vague concept, it is best to break your goal achievement down into concrete monthly achievements. January: Evaluate your objectives (e.g. get hired by a design agency / become a freelance writer / look like a sound professional when searched for online…) and establish the best platforms and media through which those objectives can be reached. March through September: Establish a baseline amount of content you contribute to your collective online portfolio each month and STICK TO IT! December: Get more feedback, amend your work accordingly, and prepare to begin using that portfolio come 2014! Achievable goals are usually broken down into component parts. All sorts of goals are paired with special systems that make it easier for those pursuing them to approach their end states through a series of manageable baby steps. By creating an editorial calendar of your own, you may find it easier to achieve your online writing goals for the coming year- whatever they may be. Brainstorm and outline what you want from the year. It is fine to lay out several different goals; editorial calendars are particularly useful in making it easy for you to fit and weave them together. Create the editorial calendar by deciding what, when, and where you will publish different articles, videos, social media posts, and other pieces of content that are related to your goals. Write, edit, and publish your work according to the calendar’s schedule. Considering how you can make the most of different seasons. Consider cashing in on holiday subjects or seasonal events by making sure that you start publishing Hubs on the event around one and a half months before it occurs. Being flexible. One can hardly anticipate everything that will happen in the coming twelve months. Be sure to make your calendar flexible. For example, do not make all of the content you write in September dependent on the content you write in August- something might come up in that month that drives you to focus on something else for a spell, and it would be bad if one small deviation from your calendar completely derails your goal achievement process. Being reasonable. We often overestimate how much we will be able to achieve in any given time frame. Keep your expectations somewhat low in the beginning. If you find that you are capable of publishing high quality Hubs than you initially expected, you can always adjust your objectives accordingly. As you do not need any special software to create an editorial calendar (all you really need is a physical calendar or a spreadsheet), you can get started right away. I hope you find it to be a helpful tool! Creating Hubs about your goals as you go about achieving them is an excellent way to gain more readers, make use of research you have already done, and make sure that you actually stick to your goals. To help you create Hubs on the pursuit of goals that will be more likely to succeed, I would like to share with you the specific elements of a good goal-oriented Hub. The most important thing to remember is that, while you may be writing about a personal goal, your primary focus should be on the needs of your readers. Your Hubs on goals should consist of guides, not personal stories. While it is fine to mention your personal experience, bring up unexpected difficulties you experienced, and provide the occasional personal anecdote, all of those details should be presented in a way that delivers useful information to readers. For example, you might share unexpected bumps in your goal achievement quest in a Text Capsule titled “Common Roadblocks on the Path to Weight Loss” and present bullets summarizing problems you experienced and methods you used to overcome them. Another thing you can do to keep your Hubs reader-friendly is to make your personal stories and advice as succinct as possible. Avoid long paragraphs and utilize bulleted lists and lots of short Text Capsules with descriptive subheaders and supplementary images, videos, polls, quizzes, and tables. When sharing advice on creating and achieving goals, Hubbers typically create a collection of related Hubs that are linked together within the text of each Hub and also put into a Hub Group. This is an excellent means of developing a small online niche (something that is particularly worth doing if the goal you are covering is not very well-covered online). That said, be sure that each Hub you write is a self-sufficient guide that completely covers one subset of the overall goal achievement process (e.g. Hubs with titles like “Buying New Clothes While Losing Weight” and “How to Deal with Weight Loss During the Holidays”). Do not give your titles parts, and do not open your Hubs with “as I mentioned in my last Hub…” because most people (1) have not read your last Hub and (2) probably don’t even know what a Hub is because they found your article through search results. One reason why Hubs on the pursuit of goals are so successful is that they are truly genuine. Articles that leverage real experiences of their authors tend to do much better than those built on shallow research and generalizations. To leverage the personal experience that goes into these goal-oriented Hubs, include as much original media as possible- videos, images, and more! Before and after photos, especially when juxtaposed, have the potential to make your Hubs particularly popular. We’re all suckers for makeovers! Hubs that incorporate these best practices have a real shot at seeing long-term success. Here’s hoping that you are just as successful at writing popular Hubs as you are at achieving your goals next year! Why Write About Personal Goals? While we are highly interested in the HubPages-related goals you create, we also encourage you to share your personal goals through your Hubs. When presented properly, Hubs on tracking and achieving personal goals can be very helpful to others- and lucrative to the Hubbers who create them! If you’re not quite convinced about the value of sharing the pursuit of your goals through your Hubs, read on. Good, detailed, major goals require a lot of research and time to put together. If you go on a diet, you will typically choose a particular approach or diet, establish a plan, and do some research on helpful recipes, motivational tactics, and exercises that can help you make good progress and stay on track. Why not share all that useful information? So long as you present your findings in Hubs with search-friendly titles and make sure that each article you write (while perhaps associated with other articles about this goal) stands on its own as a complete online resource, you have a good chance of driving a decent amount of search traffic to your work. Why do Hubs on goals (when properly made) have a good shot at driving search traffic? Because if you have a goal, chances are a lot of other people have the same goal, and in all likelihood they’re typing queries into Google about it. One of the greatest methods used by Hubbers to write Hubs that get a lot of traffic and attention is to select topics in which they have personal interest but for which they have little luck finding good search results. If there is not much information online on reaching a particular goal (e.g. you can’t find many guides to becoming a good indoor cactus farmer), you should fill in those gaps yourself by sharing Hubs on the process. Because you have made your goal public and you know that people are tracking your progress, you will be far less likely to give up because you know you are ‘being watched’ and a desire to not disappoint those who are cheering you own. By giving people advice on achieving a goal you are in the midst of pursuing, you are putting yourself in the mindset of one who is likely to achieve that goal. By writing guides, you are essentially saying to yourself ‘I am the type of person who achieves goals and is good enough about achieving them to give advice to others!’. The more you think like that sort of person, the more likely you are to become that person. Before I get you too excited about this whole goal writing process, I want to warn you that many, if not most people who write on HubPages about their goals do so in a way that pretty much prevents them from being successful. By avoiding these problems and focusing on creating search-friendly, stand-alone Hubs that are designed to help others, you can avoid this folly. Share Your Goals With Us! As you go about setting and sharing your goals for 2013, we hope you will share them with us! We encourage you to tweet your goals to us on Twitter and include the hashtag #HubPagesGoal, and to post your 2013 objectives on our Facebook wall as well. We’re especially interested to hear about any particular systems you are adopting that will make it easier for you to achieve your goals. If you have created a vision board for 2013, a special checklist you keep on your fridge, or something else visual and fun, snap a photo of it and share it with us! Your idea might be just the sort of inspiration another Hubber needs as she develops goals and achievement mechanisms of her own. Can you believe the year is almost over? With 2013 right around the corner, it is time to set goals! Throughout the month of December, we will be sharing tips and advice on creating, sharing, and sticking to your 2013 goals- both on HubPages and beyond. We encourage you to start by reflecting on the past year and asking yourself some questions: Did you set goals last year? Did you reach them? What got in your way? What were the high points of 2012? What were your low points? Did you learn any important lessons? What are your proudest achievements of the past twelve months? Finally, where did you start at the beginning of 2012, how far have you come, and where do you want to be when next year comes to a close? 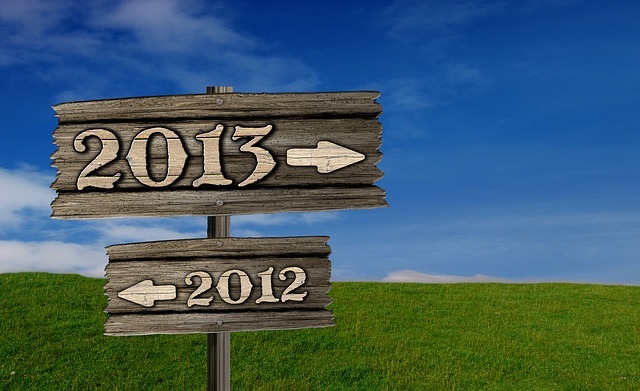 The more you contemplate your highs and lows, wins and losses, and lessons learned in 2012, the more equipped you will be to begin creating new goals and objectives for 2013. Even if you don’t typically set goals, we encourage you to make some this time around. After all, you’re not likely to achieve something fabulous if you don’t strive for it, and it is rather difficult to strive for anything at all without first establishing what one wants! We know selecting goals isn’t easy. If you get stuck, don’t worry! We’ll share some fun suggestions later this week.